When I think picnic, my mind immediately turns to chicken, roasted or fried, potato salad, corn on the cob, cookies and a fruity dessert. To complete the picture, a red-checkered tablecloth, glasses of lemonade and a bottle of rose. This vision was overturned when we got together with some friends for a picnic by the water. A great spread of Chinese food. 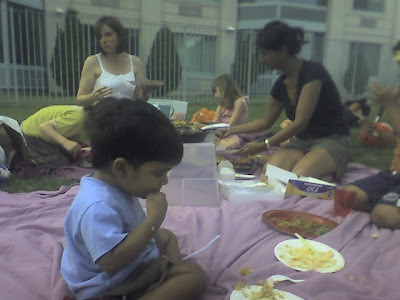 Noodles, sauces, rice, dumplings and all manner of dishes covered the blankets. My friend G. had organized everything, hauling blankets, cutlery, beverages and more, along with ordering up everything off of the menu from Confucius. Although it wasn't the picnic I envisioned, it turned out to be just right. 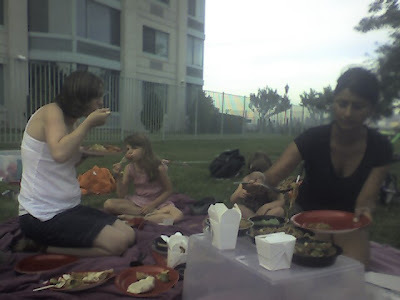 Turns out that my G., harbors the same picnic fantasy that I do but she opted to go the simple route, which turned out to be perfect when there is far too much else to do. dumplings. they are my 'happy' food. Amy: Izzy loves dumplings too.